One of the things that takes waaay to much of my time is when I have to pick a specialist tech and, being the power gamer I am, I have to manually search every single Ai. I have to check every AI I have meet to see what techs they already know so I can trade for the others. Likewise its really annoying when there is a normal tech I need ASAP and I need to spend ages searching to see who has the tech im looking for. This is especially difficult in multi player when there is limited times between turns to keep the game flowing. To me there is no reason this shouldn't be added in the main game, we already have the ability to check the techs of each AI one by one, the only change this would do is to make it so much easier and efficient. The AI is able to instantly check all techs of the other races why cant the player? -Of course if you dont know of the AI yet they are not listed. -If you are at war with the AI they are also not listed. -Ideally I would love for it to show you "X-turns to they will speak to you again" but that isnt even in the main game yet. To me this is a simple UI change that has huge benefits both in functionality, reduced turn time due to not having wait waste so long searching, and as I said its not giving the player any benefits the AI dont already have. this should be tied with spying. You send a spy in an empire, and if not affected to anything particular, they will slowly learn the extent of their research. However, you could be aware that a tech is known by another player, but just not know who it is. Conversely, it would be nice to be able to see in the diplomacy screen if you already have one of the alternate techs to what the other player can offer / is offering. 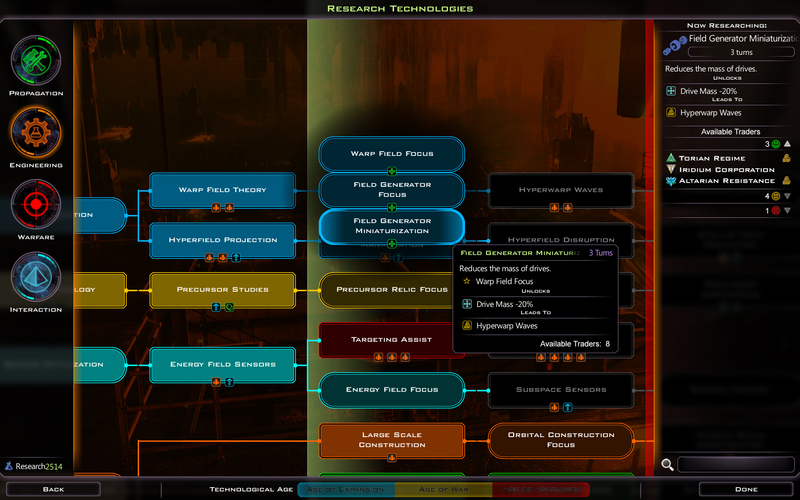 If you can see in the trade screen whether or not an empire has tech X available for trade, that information should be available anywhere in the GUI it makes sense to have it. Civ4 did this right. Really right. Because they understood that some people really do check each turn to see if any tech trades have opened up - with tech brokering enabled, you either keep up or you fall out of the brokering loop. I challenge the Crusade designers to meet the gold standard set by Civ4: let me see on *one screen* all the potential tech trades I have. Hell, the gold+ standard would be "let me select whether or not I'll consider tech trades with this empire" on an empire by empire basis so I didn't have to scroll through a bunch of empires I either don't want to advance or don't care about. Until GalCiv3 meets at least the gold standard, I leave tech brokering disabled and sometimes just turn off tech trading entirely because it is too much of a PITA. If I were a galactic emperor, you'd better believe my science advisor would have this information in an easy-to-digest format at a moment's notice and not just shrug and say, "I dunno, go talk to the Altarians and see what they have on tap". And if he didn't, I'd make a point of eating him in front of his successor (why no, I never play the Drengin, why do you ask?). Are there that many people who play with techtrading on? I do also. Would take an essential part of the game away if I disabled that. Tech trading on/tech brokering off is my preference for all 4X games I have played. I would be surprised if there weren't a large majority who have tech trading on. It seems to be a very popular game mechanism at all levels of play. Tech brokering is something long time 4X players seem to hate. I think it can be especially troublesome in the games with lots and lots of AI opponents, both in the amount of trades between AI players and in the human ability to leverage the advances of one faction versus the others. But tech trading is how I can keep up with the early game against Godlike or Incredible AI, or part of it, anyway. Tech trading on/tech brokering off is my preference for all 4X games I have played. That's pretty much what I do with all of my games also. Hate to be the bearer of bad news. ATM we can not mod the UI.